TASK: Process acquired resources. Optimize consumption. There are 15 entries for Seventeen of Eighteen (ST1E 13 C 62) at the Tradeplace (62 haves and 1 wants). Click here to see all trade list entries for this Common card! 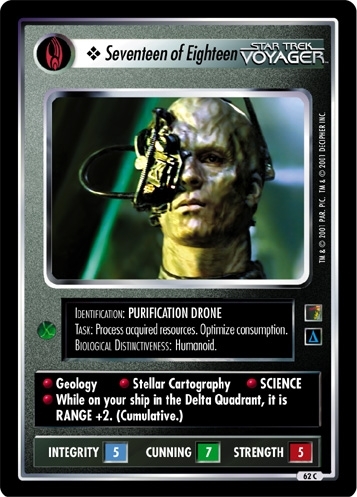 Also see here for all trade lists with any card fom "The Borg".